St. Louis newspapers saw huge traffic spikes during their coverage of the Ferguson, Mo., protests, with one editor saying the event pushed his team into the "24/7 digital journalism reality." TownNews.com partners, St. Louis Post-Dispatch (stltoday.com) and the St. Louis American (stlamerican.com) saw surges in web and mobile pageviews, bandwidth and unique visitors while reporting on the unrest in Ferguson, where an unarmed black teenager was shot by a police officer in August. A demonstrator throws back a tear gas container after tactical officers worked to break up a group of bystanders on Chambers Road near West Florissant on 9/13/2014. Photo by Robert Cohen, St. Louis Post-Dispatch. Used with permission from the St. Louis Post-Dispatch. Both sites rely on TownNews.com for their web hosting and digital publishing infrastructures. Extreme events can stress even the most robust digital sites, but stltoday.com and stlamerican.com experienced no issues. The sites not only stayed up, but continued to deliver innovative, multimedia updates to their communities and the nation. TownNews.com's flexible content management system allowed the sites to quickly transform into breaking news hot spots. The sites' homepages featured interactive coverage such as live Twitter widgets, video streaming and photo galleries, that were updated frequently. The publications used social networks, email alerts and push notifications to drive traffic. Referrals from sites such as Google and Drudge Report also contributed to the influxes. In the days following the August 9 shooting, stltoday.com experienced sharp bandwidth spikes. Total bandwidth was approximately 507 gigabytes on the day of the shooting, but within two days, it skyrocketed to over 1,660 gigabytes. Monthly visitors also soared, nearly doubling July's count. The bulk of the traffic was direct or came from internal sources, but popular sites such as Google, Bing and Drudge Report also contributed to the influx. 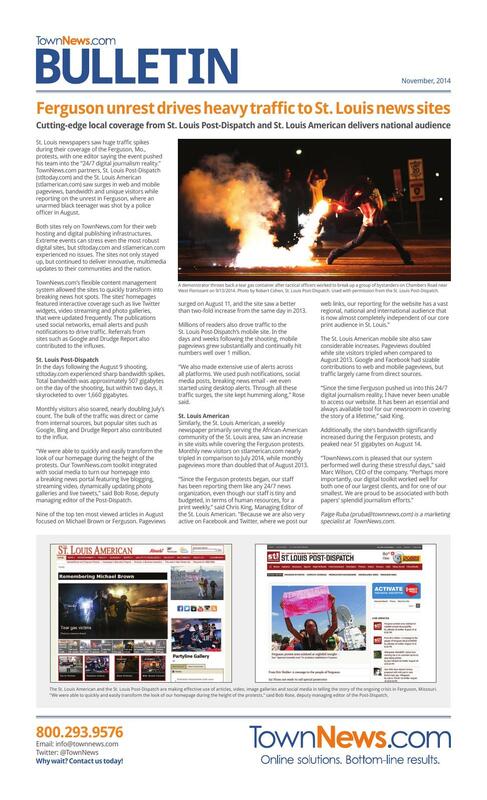 "We were able to quickly and easily transform the look of our homepage during the height of the protests. Our TownNews.com toolkit integrated with social media to turn our homepage into a breaking news portal featuring live blogging, streaming video, dynamically updating photo galleries and live tweets," said Bob Rose, deputy managing editor of the Post-Dispatch. Nine of the top ten most viewed articles in August focused on Michael Brown or Ferguson. Pageviews surged on August 11, and the site saw a better than two-fold increase from the same day in 2013. Millions of readers also drove traffic to the St. Louis Post-Dispatch's mobile site. In the days and weeks following the shooting, mobile pageviews grew substantially and continually hit numbers well over 1 million. "We also made extensive use of alerts across all platforms. We used push notifications, social media posts, breaking news email - we even started using desktop alerts. Through all these traffic surges, the site kept humming along," Rose said. The St. Louis American and the St. Louis Post-Dispatch are making effective use of articles, video, image galleries and social media in telling the story of the ongoing crisis in Ferguson, Missouri. “We were able to quickly and easily transform the look of our homepage during the height of the protests,” said Bob Rose, deputy managing editor of the Post-Dispatch. Similarly, the St. Louis American, a weekly newspaper primarily serving the African-American community of the St. Louis area, saw an increase in site visits while covering the Ferguson protests. Monthly new visitors on stlamerican.com nearly tripled in comparison to July 2014, while monthly pageviews more than doubled that of August 2013. "Since the Ferguson protests began, our staff has been reporting them like any 24/7 news organization, even though our staff is tiny and budgeted, in terms of human resources, for a print weekly," said Chris King, Managing Editor of the St. Louis American. "Because we are also very active on Facebook and Twitter, where we post our web links, our reporting for the website has a vast regional, national and international audience that is now almost completely independent of our core print audience in St. Louis." The St. Louis American mobile site also saw considerable increases. Pageviews doubled while site visitors tripled when compared to August 2013. Google and Facebook had sizable contributions to web and mobile pageviews, but traffic largely came from direct sources. "Since the time Ferguson pushed us into this 24/7 digital journalism reality, I have never been unable to access our website. It has been an essential and always available tool for our newsroom in covering the story of a lifetime," said King. Additionally, the site's bandwidth significantly increased during the Ferguson protests, and peaked near 51 gigabytes on August 14. "TownNews.com is pleased that our system performed well during these stressful days," said Marc Wilson, CEO of the company. "Perhaps more importantly, our digital toolkit worked well for both one of our largest clients, and for one of our smallest. We are proud to be associated with both papers' splendid journalism efforts." Paige Ruba (pruba@townnews.com) is a marketing specialist at TownNews.com.